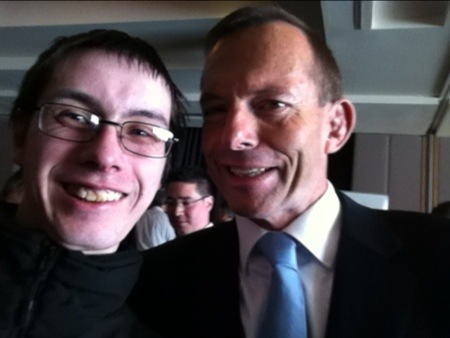 Tony Abbott delivered a rousing and encouraging speech on the subject of freedom of speech today. He made a number of important points, but in my view the most important thing he said is that he will repeal section 18C of the Racial Discrimination Act, if elected as Prime Minister. Section 18C is, of course, the section which Andrew Bolt was deemed to have breached for daring to suggest that some people with tenuous links to Aboriginal heritage might not really be entitled to claim governments benefits afforded to Aboriginal people. The Coalition will repeal section 18C in its present form. Expression or advocacy should never be unlawful merely because it is offensive. It ought to be inconceivable that a commentator offering an opinion should fall foul of the law just because offence was taken or might be expected to be taken. This is not a matter of agreeing or disagreeing with Bolt. It’s a matter of an expansive or a repressive view of the right to free speech. An edited, but lengthy, extract from Tony Abbott’s speech was published in The Australian this morning, and can be read online on The Australian’s website (subscription required, and personally recommended by me). As I write this, I see that the full speech has appeared on Tony Abbott’s website at http://tonyabbott.com.au/News/tabid/94/articleType/ArticleView/articleId/8833/Address-to-the-Institute-of-Public-Affairs-Sydney.aspx. If you have the time to spare, I would strongly suggest reading it as it outlines why Tony Abbott believes in, and will defend, freedom of speech. Now, to be clear, I would go further than Mr. Abbott insofar as I would push for a level of freedom of speech akin to that bestowed upon Americans by the United States of America’s constitution, but I applaud Tony Abbott for taking significant steps in the right direction. On a personal note, it was a great pleasure to meet exiled radio broadcaster Michael Smith. We had a brief exchange, but I made my support for his plight quite clear, and he assured me that he will return to the airwaves eventually. The sooner the better in my view. 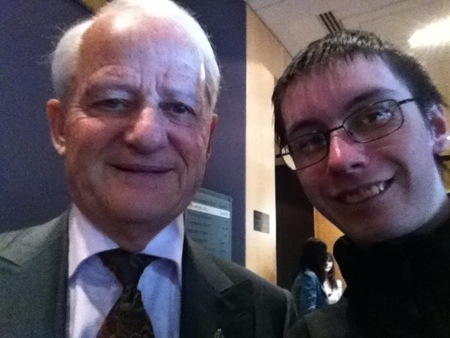 It was also wonderful to briefly greet both Tony Abbott and Phillip Ruddock. It is not the first time I have met either of them as I met Tony Abbott at the Convoy Of No Confidence rally against the Gillard government’s appalling carbon dioxide tax, and met Phillip Ruddock at his brief media interview for the swearing in of Justice Susan Kiefel to the High Court. Even so, it was wonderful to share a moment with them again. Thanks must go to the wonderful people at the Institute Of Public Affairs for providing the forum and support for this wonderful event (and yes, I am aware that as a member of the IPA I am, in effect, thanking myself to a small extent…but really this is aimed at the staff) and also the staff of the Amora Jamison Hotel for setting up the venue and being so welcoming…and for the lovely coffee! Freedom of speech is in trouble in this country, so it is good to know that those of us who believe in it are not alone in our beliefs, and we have the backing of some people in or near positions which can make a significant difference. Update Thursday August 9: Video of the full speech is now available. 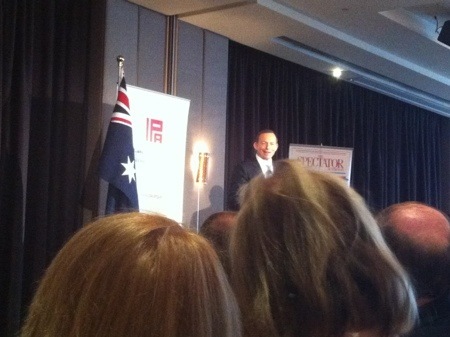 Tony Abbott starts speaking at the seven minute mark. You are definitely not alone concerning freedom of speech, & it’s importance in our Australian identity. That’s good to hear Noel.